Lisburn girl Hannah Roberts with Jedward, who made her dream come true and arranged for her to swim with Fungi, the famous dolphin. 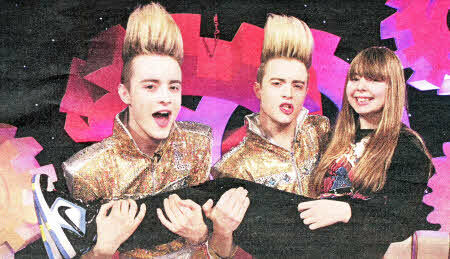 LISBURN girl Hannah Roberts' dream came true recently when her pop idols Jedward selected her for their new TV show and arranged for the local girl to fulfill her ambition to swim with a dolphin. Hannah, 13, who will appear on OMG! Jedward's Dream Factory on RTE Two over the Christmas period, was whisked away to County Kerry to meet the famous 'Fungi' the dolphin as the twins made her dream a reality. Wallace High School pupil Hannah said the event was a "double dream" as she finally got to get close to her favourite pop duo. 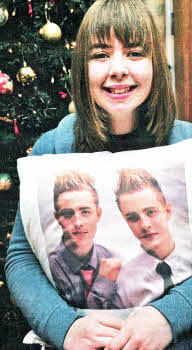 Her mum Barbara explained: "Hannah saw on Jedward's website, Planet Jedward, about this competition. She is a big Jedward fan, she goes to every concert they have here and went to their Panto in Dublin last Christmas and we're going again this Christmas, and she's a dolphin fan so it was perfect. I had to actually click the button to send off her application because she kept saying, 'I'll never be picked for something like that'." Barbara, however, soon received a phone call to say Hannah's dream had been accepted and was given instructions to film her daughter as she opened a very special letter from Jedward. "I was over the moon for her," said Barbara. "At that stage I didn't know where she would be going or swimming. When she found out she was in tears, they got me to film it as she opened the letter and they will use that for the programme." All of Hannah's family and friends, including her sister Rachel, 12, and brother Adam, 8, as well as her teachers will be watching out for her on TV. "It will be brilliant to see it," said Barbara, who went with Hannah and Rachel to the RTE studios to meet Jedward in October. "I can't wait to see it when it all comes together." Speaking about Hannah's experience with Fungi, Barbara said: "It was absolutely fantastic, I've never seen her smile as much in one day. She was so confident swimming with the dolphin, it was magical." Speaking about her experience, a delighted Hannah said: "My dream all started when I was about 3 or 4, maybe even younger, when I was on holiday with my family. We went to see a dolphin show and I thought they were fantastic. The trainers in the show were swimming in the water with them and I wanted to get in and do it too. I have been a big dolphin fan since then. "When the OMG! Jedward's Dream Factory came up, my first thought was the dolphins, would I be able to fulfill my dream, so I entered and to my great surprise I got through. Not only to swim with my favourite animal but to meet my favourite group. It was a double dream." Hannah added: "The whole thing was brilliant. My mum and I went down to Dingle Bay and I had the best time of my life, I couldn't believe that I was in the water with a wild dolphin. The diver kept calling him and he swam round me wanting to play, I could feel him against my legs in the water, I can't really describe the feeling, he didn't make me feel nervous, it was a strange feeling and one that I would like to experience again. I would love to be a Marine Biologist when I finish school and work with dolphins. "My other part of the dream was when I met Jedward, I have been to every one of their concerts, so it was brilliant that they were going to interview me on the show. I couldn't believe that I was going to be able to talk to them properly, even though we were being watched by lots of people and cameras everywhere, it was great and they where brilliant, they asked me all about my swim with Fungi and presented me with the OMG! Jedward's dream badge. "I got photographs taken with them, they were so nice to talk to and made me feel very comfortable. The whole thing has been fantastic, I'm going to see Jedward on December 21 in panto in Dublin and I hope that I will be able to meet them again," Hannah said. OMG! Jedward's Dream Factory airs from Christmas Day at 11 am on RTE Two, through to early January, when Jedward will make dreams come true for children across Ireland and Northern Ireland on their first ever television show.